Now why can't I have a girlfriend that plays diablo/cuddles with me?? @Musicpays, my boyfriend is the opposite...he hates it when I play vido games.. Hour only? (pause) Oh yeah, bathroom break. Hey I just met you, and this is crazy, but join our forum, and don't be lazy. Hey if anyone's still interested the forum it's easy to find. It's on v-bulletin. We'd love new members. You'll see many familiar faces theyre. More recruiters should be coming. Don't worry our intention isn't to spam. Anyways FPE Forums wants you! Ok seriously. Stop it with Diablo. Who the puck took that pic? So How many people have died because of Diablo addiction so far? @RealForeverAloneGuy: I bet a girl is saying the same about having no boyfriend. She's out there, bro. Repost, but still a funny picture. Up-up down-down left-right left-right b-a-b-a select start? Me: Why are your Pokémon's levels so low? They need to be higher Boyfriend: WELL NOT ALL OF US PLAY POKÉMON 24/7!! Me: You'll get crushed by Flannery. I told you to pick Mudkip! Boyfriend: walks away. 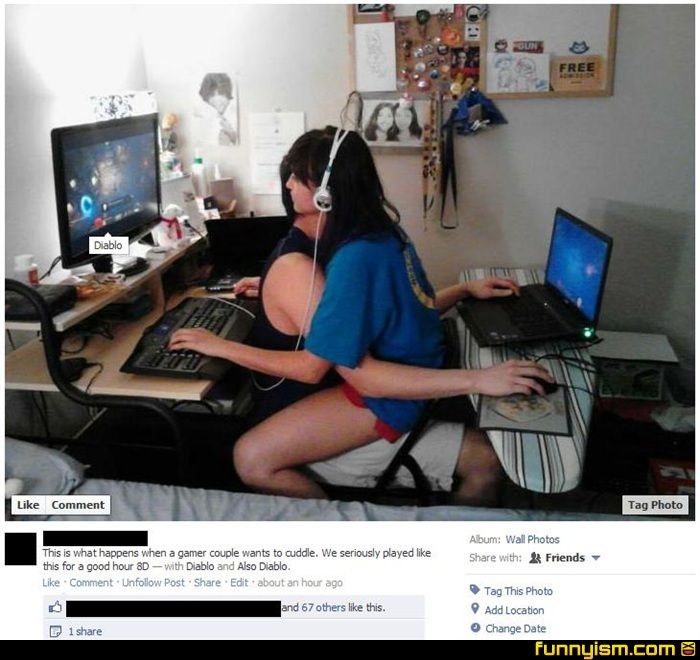 That's how my gaming relationship works. How can he not have a b*ner? This is seriously a way better love story than twilight. Frigging retoasts... WE GET IT STUCKPIXEL YOU LIKE THIS PHOTO! @osama -_- why would he need to fap when he has a gf?